Aalayam - Colors, Cuisines and Cultures Inspired! : Avial - A Melange of Textures and Flavors! Avial - A Melange of Textures and Flavors! Isn't it glorious that we can derive inspiration from world cuisine to create delicacies in our kitchens daily? Isn't it a blessing that we don't confine ourselves to the pallette and textures of one single cuisine, but seek a melange of flavors from harvests and spice bazaars around the world to satiate our taste buds? If you are one after my own heart, then read on..about Avial, comfort food born in God's own country, Kerala (India) served with Quinoa, a nutritious grain-seed originated in the Andean regions of South America, resulting in a holy confluence of nutty textured grain, chunky vegetables in a creamy yogurt sauce topped with choppy coconut flakes and earthy curry leaves. Avial - a dish so succulent with textures and flavors..so rich in history and mythology, and a staple in a vegetarian Kerala meal "Sadya", has held my fascination for a long time. This dish was recently revived in my culinary memory, thanks to my sister-in-law..who I quote makes a "Wicked Avial"! Quinoa is a staple now in our house. Pronounced KEEN-wah, this highly nutritious gluten-free seed is used as a terrific substitute of rice. Quinoa is an exceptional source of protein, good source of dietary fiber, B vitamins and iron. 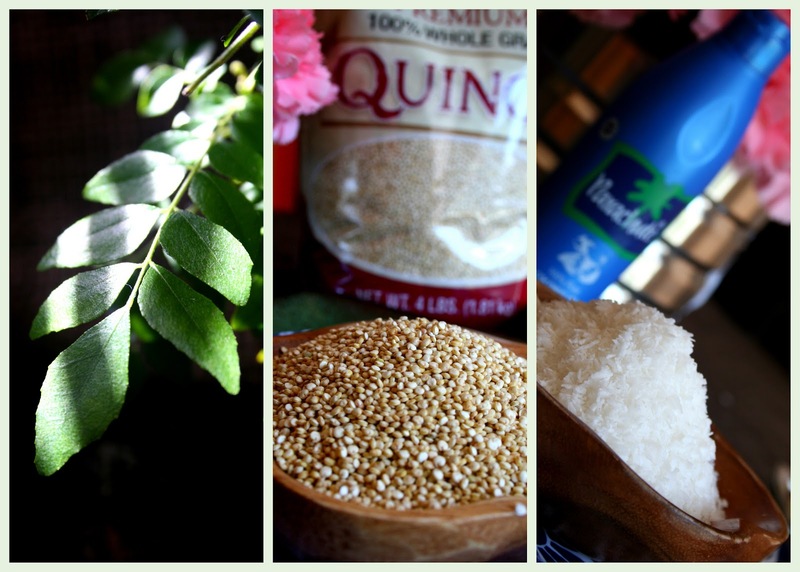 Quinoa is an ode to guilt-free eating! Inspired by this, I thought, what better way to bring together the spices, flavors and textures of South India and South America in one plate? This gave birth to my Avial Impetus! Fall is the best season to make Avial because of the lush harvest vegetables which lend themselves beautifully to this dish. Vegetables commonly used in Avial are sweet potato, yam, plantain, pumpkin, carrots, beans, cucumber, drum sticks, snake gourd and avarai. This dish can be made into a gravy or into a semi-solid side curry. Avial captures the earthy flavors of curry leaves seasoned in coconut oil, with the tangy spice of a chili-cumin yogurt sauce blended with onions and coconut flakes. Avial has a mythological significance too. It is supposed to have been invented by Bhima (one of the Pandava brothers) during his "Agnyathavaasa" exile. According to the legend, when Ballav (Bhima's name during this time) assumed his duties as the cook in the kitchen of Virata, he did not know how to cook. One of the first things he did was to chop up many different vegetables, boil them together and top the dish with grated coconut. Bheema is said to have prepared Avial, when there were unexpected guests for King Virata and he needed to serve a meal for them. There were no sufficient vegetables to cook any single recipe for side dish, so Bheema used whatever available vegetables to make a new dish, which came to be known as Avial!! So, if it worked for King Virata's court, it sure can work for me!! I leave you with exquisite Avial from the Aalayam Kitchens served on a bed of Quinoa..
p.s. The royal blue block print patterned salad plates are from our friendly neighborhood Target! (pronounced as "TAAR JHAY" for hauteness). The Avial dish is an antique. The elephants are adding a touch of Kerala to the tablescape.